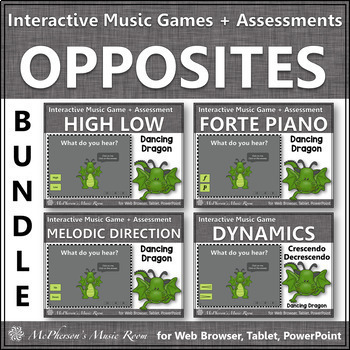 Looking for engaging music activities for your elementary music lesson that will reinforce aurally identifying music opposites (high/low, loud/soft, loud/quiet, up/down, forte/piano, crescendo/decrescendo or step/leap/same)? 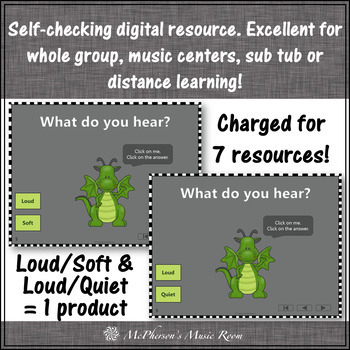 These digital resources are excellent additions to your music lesson plans or anytime you are working on music comparatives. 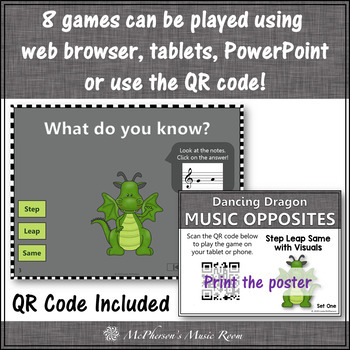 Engaging music games for the entire class, music sub tub or music centers! Perfect additions to your Orff lessons and Kodaly lessons. The Bundle contains 7 resources that are sold separately in my store. Click on a product name or the preview button for additional details. Consider purchasing the bundle to save money! Please note that the discounted price reflects 6 products. I did not charge for both products that reinforced the concept "loud/soft" or "loud/quiet". The Bundle contains 7 resources that are sold separately in my store. Click on a product name or the preview button for additional details. Consider purchasing the bundle to save money! 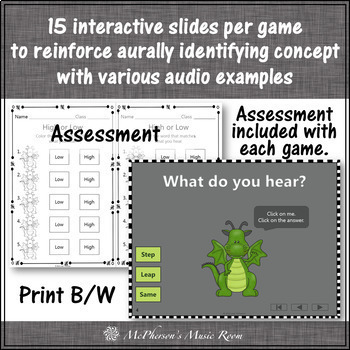 Each resource contains 15 student interactive slides. Each slide has several sound effects and animations. Students will click on the dragon to hear a sound. They will then click on the answer that represents what they hear! Students will know immediately without leaving the page if they are correct. Be prepared for a brain break of laughter and movement when they select the correct answer. Excellent observation or assessment tools to see which students might be struggling with the concepts. The products were created to be compatible for PC and Mac users utilizing PowerPoint. However, please download the preview as a test prior to purchasing!